Jake Ruane, left, of Haverford tries in vain to get away from the grasp of Evan Hrivnak of Garnet Valley during the 1s quarter at Haverford High on Sept. 7, 2018. 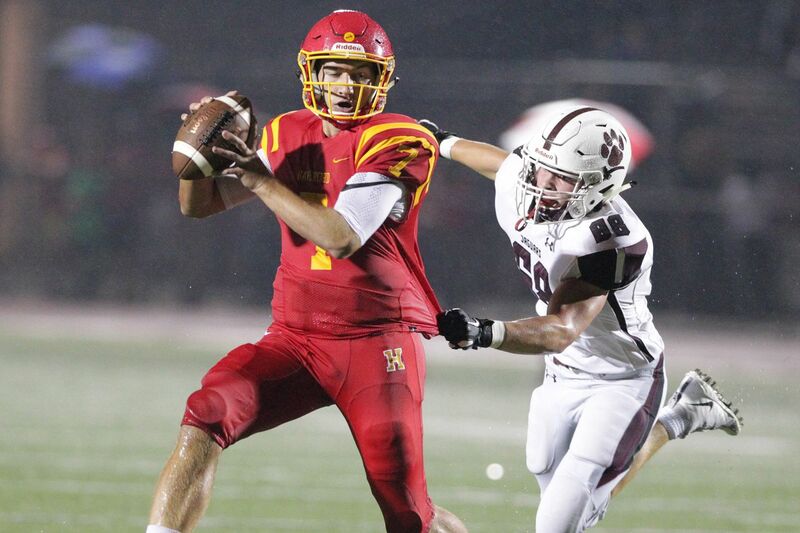 After holding a four-point lead at the half, Jake Ruane threw three touchdown passes to Shane Mosley in the second half as the Haverford High football team handed Radnor its first loss of the season with a 40-16 victory on Saturday. Ruane finished with four passing touchdowns, finding Trey Blair for 18 yards in the first quarter, and ran for another 43-yard touchdown. Both teams are 4-1 overall, and 3-1 in the Central League. Jake Ruane, left, of Haverford passes against Garnet Valley during the 1st quarter at Haverford High on Sept. 7, 2018. Alex Goldsby rushed for three touchdowns, including two in the third quarter, to lead Conwell-Egan past Neumann-Goretti, 42-30. Goldsby's third score of the day — a 2-yard run — was set up by Patrick Garwo's 79-yard run, and gave the Eagles an 11-point lead in the third quarter. Garwo added two rushing touchdowns while Terome Mitchell returned a kickoff 76 yards for a score for the Eagles. Terome Mitchell returns the kickoff 76 yards for an Eagles touchdown! In a game that featured six lead changes, Truman blocked Neshaminy's extra point with a minute remaining in a 27-26 triumph. Brody McAndrews scored on a 1-yard run to bring the Redskins within a point after the Tigers' Deondre Winton scored the deciding touchdown on a 4-yard run with four minutes left. James Koliyah added a 21-yard interception return for a touchdown in the win. Tom Santiago totaled 174 yards on the ground and two touchdowns as Archbishop Wood topped Archbishop Spalding (Md. ), 20-7. Santiago's first touchdown from 12 yards out capped off a 15-play, 70-yard drive for the Vikings. Jake Ross also added a rushing score for the victors, which finished another 70-yard drive on 13 plays. Wood begins Catholic League play next Saturday against Roman Catholic. Episcopal Academy overcame a 14-point halftime deficit to beat the Hill School, 27-21. Billy Adams scored the winning touchdown on a 1-yard run with eight seconds remaining, and started the comeback with a 45-yard touchdown run in the third quarter. Matt Bush tied the game for the Churchmen with less than three minutes left with a 1-yard run. Tyriq Lewis recorded five touchdowns as Downingtown West rolled past Great Valley, 49-14. Ryan Engro threw three touchdown passes and ran for another as Spring-Ford defeated Norristown, 36-6. Nick Teets caught two touchdown passes of 14 and 78 yards for the Rams. Stephen Brill and Daniel Watson each found the endzone on the ground in the win. Mekhi Ajose-Williamson highlighted a 69-point performance with a rushing touchdowns from 10 and 42 yards to lead Haverford School past Chester, 69-34. Holding an eight-point lead, Ajose-Williamson long touchdown run midway through the third quarter extended the Fords' lead to 15. It took just 10 minutes of game-time for the Fords to build a 35-point cushion thereafter. Malik Langley had a receiving score and a 5-yard rushing touchdown in the win. Max Perry tossed four touchdowns to lift Springfield Monto over Dover High School, 33-6. Brennan Fleur hauled in two of those scores from 7 and 22 yards out. Perry also found Amir Williams and Paul Asman through the air. Carter Stetney contributed a 64-yard touchdown run for the Spartans. Jeb Brenfleck finished 8-for-9 for 127 yards and three touchdowns in Academy of New Church's 35-7 victory over Jenkintown. Glen Saab received two scores from 25 and 61 yards. Devin Bryant racked up 163 rushing yards and two touchdowns for the Lions. Bryce Fadako made 15 saves in net to lift Archbishop Ryan over Springside Chestnut Hill, 3-2. Sidiki Fofana scored twice while Dylan Devlin added a goal for the Raiders. Kieran Boyle scored the game's lone goal assisted from John Carter as Roman Catholic downed Cheltenham, 1-0. John Nelson and Kevin split the shutout in net for the Cahillites. Sam Wilson recorded his second hat trick of the season to carry Episcopal Academy past the Hill school, 3-1. Xander Lotsis and Jack Pacera contributed assists for the Churchmen, who improve to 7-0-1 on the year. Jude Corr and Oscar Southwell each delivered a goal in the first half as Shipley knocked off Marple Newtown, 2-0. Matty Scoffone scored by rebounding his own penalty kick and assisted Dimitri Makris' goal in West Chester Rustin's 2-0 triumph over Penncrest. Lower Merion defeated Easton, 2-0, behind goals from Isaac Brainsky and Cole Sanchez. Trevor Rambo and TJ Taylor each scored a pair of goals as Methacton beat Lansdale Catholic, 6-1. Maximo Chavez and Chris Meehan chipped in goals for the Warriors. Katie Harmon scored in the first half to give Nazareth Academy a 1-0 win over Archbishop Wood. Emma Elwell registered a goal in the 62nd minute to lift Boyertown over Southern Lehigh, 1-0. Campbell Power netted goals and had an assist in Souderton's 4-0 win over Lansdale Catholic. Grace Kelly and Erin O'Keefe added goals for the Indians. Upper Dublin beat Upper Moreland, 4-0, thanks to a pair of goals from Ryann Kullmann. Lauren Greene and Allie Rock added goals for the Cardinals. Maddie Rehak netted two goals as Episcopal Academy edged the Hill School, 3-2. Kelly Smith chipped in a goal for the Churchwomen. Gabby Martina led Perkiomen Valley with a goal and an assist in a 3-1 victory over Pennsbury. Kelly Baittinger and Teresa Bartkowski contributed a goal each for the Vikings. Annie Borovskiy and Sanaa Hebron scored two goals apiece as George School took down Peddie School, 6-0. Notre Dame Academy won the Spiketacular Volleyball Tournament held at Cherokee High School with wins over Cherry Hill East in the semifinals and Gloucester County Institute of Technology in the finals. The Irish represented Pennsylvania competing against 11 New Jersey high school teams, and compiled a 12-0 record. Riley Shaak led Notre Dame's offense with 68 kills throughout the tournament, while Maddie Donaphon anchored the defense with 83 digs. The Notre Dame Academy girls’ volleyball team won the Spiketacular Volleyball Tournament held at Cherokee High School in Marlton, N.J. today.